Background Music for Waiting Rooms: don't bore your Customers! How to have background music in your waiting rooms? The legal & easy way. The waiting room of any place, from a multinational company to a massage center or a hospital, it’s a place where you have to take care of the customer as if it were the most important room in your business. It is usually the room where the customer has time to think and consider what exactly he or she is doing there. Depending on whether or not they feel comfortable, they will see your business one way or another and have more or less willingness to return other times or even refer you to their friends and acquaintances. Of course, you have to take good care of the furniture, decoration, and lighting. However, here we will talk about the background music. First thing we have to know is that, if we don’t want to pay yearly fees and involve ourselves in bureaucracy it’s always better not to play famous songs in our waiting room. In the USA, only if it’s music from the radio we will not have problems. The radio station has already paid for blanket public performance licenses from the PROs (Performance Rights Organizations, like BMI or ASCAP) and as long as you aren’t charging admission for patrons to listen to it, retransmitting it, or doing a few other prohibited things, you’re allowed to leave the radio or TV on in a small business establishment without paying for a public performance license. This may seem inconvenient because our customers are familiar with this kind of music, but if dig deeper we see that is not what they want to hear because they are already bored of this songs, hearing them all day long on the radio, Internet, and television. Not to put any music so the waiting room is silent. Install a television with music. The first option is not recommended in any scenario because even in places where silence could blend with the environment, for example in a spa or massage center, they also play relaxing and meditative background music, which helps to quiet the mind of the customer and make them more prone to welfare. The second option is ideal for those businesses that prefer not to distract the client with a television or unwilling to buy one of this devices. As we discussed, we will not play famous songs, but Royalty-Free music. Perfect, where then I get this royalty-free music? 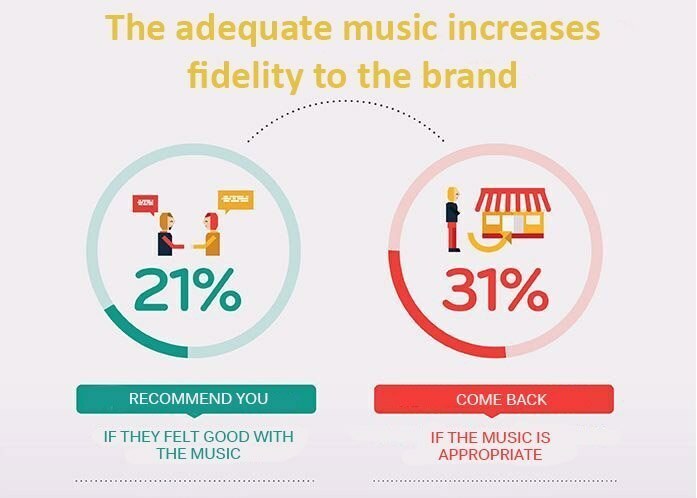 Soundtrack Your Brand: These are the same people behind Spotify (in some countries is known as Spotify for Business) and sure are the best option out there. Soundtrack offers a music streaming platform, licensed for commercial and public spaces. It costs $26.99 per location & month but the good thing is you can try it for one month for free and cancel at any time. Mood Media: A solution for big brands, they study your company and locations and offer a combination of unique sounds. They provide you with a software and hardware to handle everything from there in the easiest way possible. Primark, The Body Shop, Karl Lagerfield and The North Face are some of their clients. Soundreef: Same as Jamendo, but offers a free trial period of 15 days to see if we are convinced. The cost varies with the square footage of your stores. Dozmia for Business: You explain how’s your business and they make the perfect playlist for you. The downside is, they don’t explain the monthly cost on their website. Melody Pods: They select the music for you and update it every month with new songs, giving you a special software to handle the playlist from your smartphone or tablet, wherever you are. Looking ahead to the third option, installing a TV and play music on, it is a very good choice for the most boring waiting rooms and in which the customer spends more time, such as a dental clinic or a doctor’s office, to keep their mind distracted. Do you have a store or many stores? Then you will find interesting this other article about music for business.